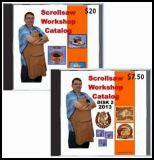 Help Cure Parkinson's Disease Scroll Saw Pattern. 60,000 Americans are diagnosed with Parkinson's Disease each year. Close to 10,000,000 people world wide are living with Parkinson's Disease. Parkinson's Disease diagnosis increase with the age of the patient but a small percentage show symptoms before age 50. In most patients the disease progresses very slowly. This means that they live with the symptoms for years. The symptoms include tremors (in the hands, arms, legs, jaw and face) slowness of movement, rigidity and impaired balance. Parkinson's Disease is not fatal but the symptoms are serious and often lead to poor quality of life and reduce the patients longevity. 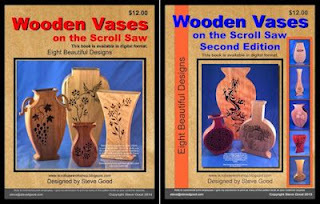 I receive many requests for patterns that involve a cause. Every person has to make decisions on which cause they can support with their time and money. All families are impacted in different ways. Every person has their own capacity to help. 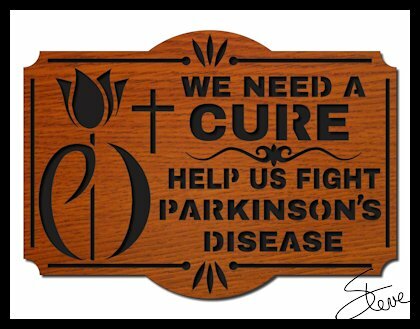 If the cure for Parkinson's Disease is something you can help support then your efforts are much appreciated by those who are living with the disease.